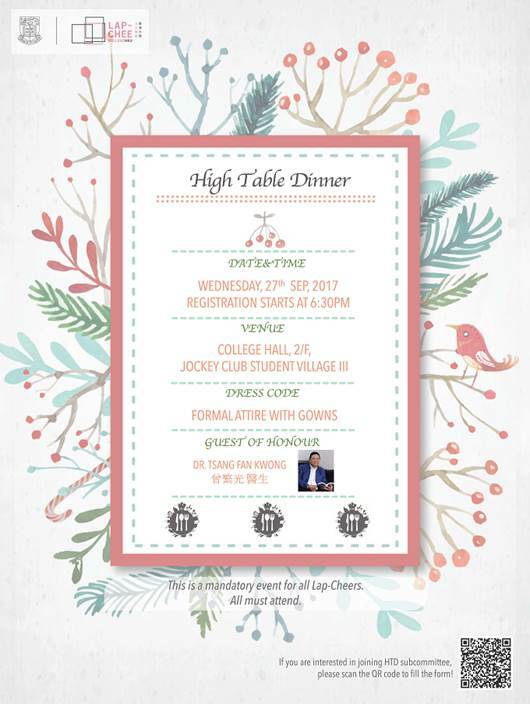 Please be reminded that the upcoming Lap-Chee College High Table Dinner will be held on Wednesday, 27th September 2017. As this is a mandatory event in Lap-Chee College, students who will be absent, late or require early departure due to classes should write to lapcheecollege@hku.hk with valid proof, and also inform your floor tutor before Monday, 25 September 2017. Any absence without prior approval will be issued with a warning letter. Dr. Tsang Fan Kwong graduated from The University of Hong Kong. Dr. Tsang is an experienced psychiatrist currently working in the private practice who had previously served in the public mental health sector for more than 20 years. He has been dedicating tremendously in mental health promotion, including emotion management, stress coping, positive psychology, establishment of interpersonal relationship and parent-child relationship. It is our privilege to have Dr. Tsang to share us some tips and advice on mental health.